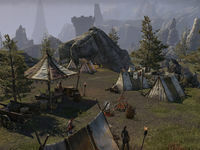 Camp Tamrith is a camp in southwestern Rivenspire, south-southwest of Shornhelm. Camp Tamrith Objective: Help the Camp Tamrith refugees and the Shornhelm Guard. 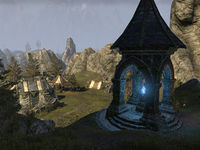 Camp Tamrith Wayshrine is located in the shadow of the cliffs to the south of the camp, east of the entrance to Shadowfate Caverns. This page was last modified on 31 March 2019, at 14:40.